Below is a general list of allowable signs. Depending on the specific application and the zoning of the sign location, regulations for your business may be different. You should always consult with the Red Oak Building Inspection Department prior to investing in any sign. Must be at least 25 square feet in size. Cannot exceed 3.25 square feet for each lineal foot of building or tenant space frontage. The main attached sign of a business may be enlarged for businesses that sit further away from the road. May not exceed 75% of the width of the elevation or business frontage. Square footage is measured by subdividing each part of the sign into common geometrical shapes. This reduces “dead space” from being calculated in the measurement. Monument signs - Allowed as a detached sign for most business areas. 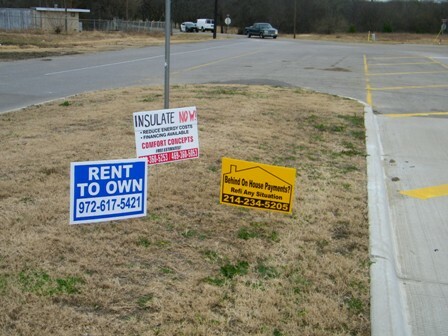 Pole Signs - Allowed as a detached sign for businesses located within the "highway corridor." Signs may be placed in a window or glass door, NO PERMIT REQUIRED, as long as no more than 40% of the glass on any one side of the building is covered. Community service, civic and educational organizations’ flyers and posters are not counted as part of the window coverage. Super-graphics are allowed with a specific use permit (SUP). Temporary signs and banners may be placed out for 30 days at a time up to 4 times per year. There must be a 60 day period between each display. A permit is required. Permanent banners must be attached to monument signs, pole signs, or private light poles with decorative stanchions. The stanchions are required to be permitted once; then the banners can be displayed with no time restrictions and may be changed out with no further permitting required. Wind devices are any device that draws attention to a business and moves freely in the wind. These include flags (Not U.S., Texas, Etc. ), streamers, balloons, inflatables, etc. Wind devices may be displayed up to 90 days per calendar year. A permit is required. No wait period between each display is required. Banners may be permanently placed on a building if it does not face the right-of-way and is directed toward the inbound drive through lanes. A permit is required. Attraction or reader boards (Think movie poster boxes on the front of a theater) are allowed with a permit in addition to the Main attached sign. Signs that interfere with or are confused with an official traffic control device.